The above verse is found in the final chapter and verses of the Gospel of Saint Matthew, Chapter 28, Verses 16-20. It is known as the Great Commission. It is read in the Orthodox Church at each and every sacrament of Baptism. It is also read as one of the cycle of eleven Resurrectional Gospel lessons read during the Matins Service on Sunday. 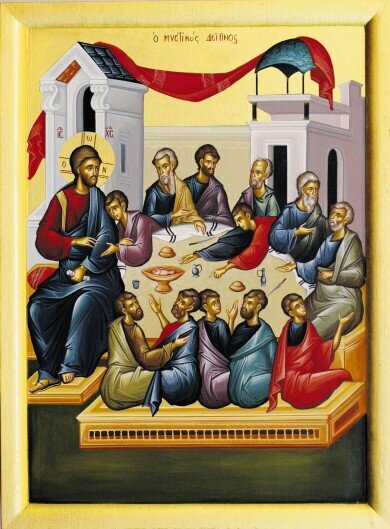 Beginning with the Sunday following the celebration of Pentecost, there is a cycle of Gospel lessons that are read, and each eleventh week we hear this very powerful Gospel lesson of Christ appearing to His disciples upon the mountain to which He had directed them. We hear this Gospel lesson at our own baptism to remind us that the sacrament is one of welcoming, not an end in itself. It is the sacrament to which we are invited as we become one of the faithful; being one of the faithful comes with a responsibility on our part. There is a responsibility to take that message of love, to take that message of peace, to take that faith, to nurture it, to allow it to grow, to bring it to the world, to show with it, by the example in which we live, so that others - in conversing with us - in observing us and praying with us - may see within us, that Light of the resurrection; that Grace of the Holy Spirit, placed upon our breast, during the Sacrament of Holy Chrismation. That they may see that Light shinning forth, be called to it, and find themselves also desiring to be baptized, desiring to become children of God. It is called the Great Commission because we see the immensity of what is being asked of us, and in contemplating that, we recognize that it is not something we can do on our own. So imagine we are being called, we are being told to come forth as we take this great weight, as we try to live up to the examples of Christ and of the Saints themselves. As we begin to move forward - even crawl at the time of our baptism - to understand that it is not a journey meant to be taken alone. That it is through God’s grace, that we become children of Light, that we carry out this Great Commission. We need to prepare ourselves, we need to be willing, to go forth, be willing to speak, to communicate, to pray. The Gospel lesson ends with a very powerful message: Christ reminding us that He will be with us to the ages of ages. Reminding us that the Resurrection, the Life that He grants us, was not simply something that was done in a period of history, was not simply an act that took place in the past. It is gift that continues to take place in the present and will always take place in the present until the ages of ages. That is how we are called to live and to celebrate. Constantly glorifying God and giving thanks to Him, forever. Amen.